With only less than a week left, we will be constantly updating this page with all the necessary information, please stay tuned. Update (7/28/2014 2:00pm): Our childcare capacity is almost reaching the maximum limit for the venue. Since we are manually tabulating the registration entries, we will send an email if in case we cannot accommodate your party. 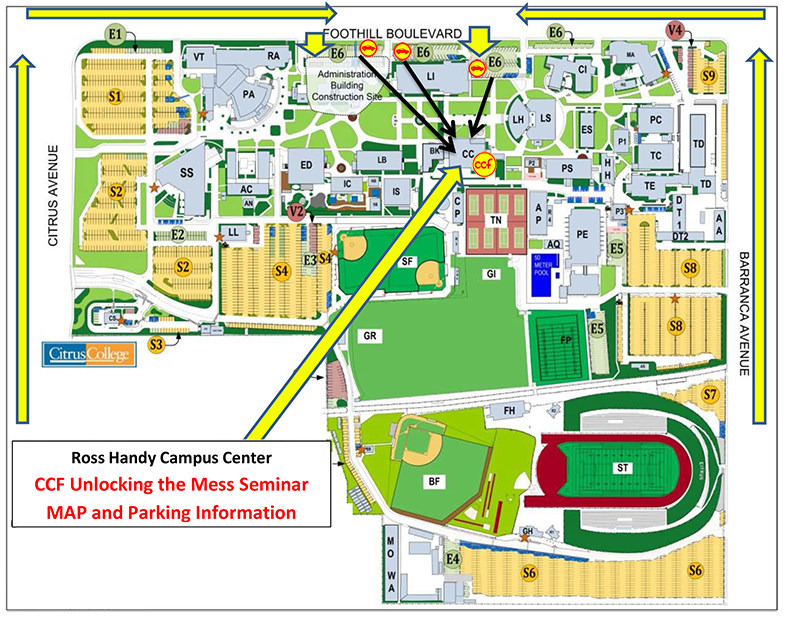 Please use the FOOTHILL BLVD entrance, and park at the E6 parking area. 1. Please go to the main registration table to have your name checked off the list (if you have pre-registered already.). If not, kindly fill out the registration form. 2. Proceed to the Child Care Registration table to have your child’s or children’s name(s) checked off. If not, kindly fill out the registration form. Read and sign the waiver form as well. Submit it to the designated adult assigned at the registration table. 3. Your child will be assigned a number on an ID bracelet that will be placed on your child’s left wrist. 4. You will also be given a release card with a number that matches with your child’s ID bracelet. PLEASE TAKE GOOD CARE OF YOUR RELEASE CARD(S). YOUR CHILD/CHILDREN WILL NOT BE RELEASED TO YOU EVEN IF YOU CAN IDENTIFY HIM OR HER. KINDLY OBSERVE THE RULES AND FOLLOW THEM FOR THE SAFETY OF EVERYONE CONCERNED. 5. Walk your child to the designated Child Care room. The Child Care team will take care of your child/children after you’ve dropped them off. 6. During lunch time, please pick up your child from the Child Care room. Don’t forget to hand over the release card to one of the volunteers so that your child/children will be given to you. REMEMBER: THE CAMPUS IS HUGE. IT IS YOUR RESPONSIBILITY TO TAKE CARE OF YOUR CHILD/CHILDREN DURING THE ENTIRE LUNCH BREAK. WE WANT TO MAKE SURE THAT EVERYONE IS SAFE. The Child Care team will also go on their lunch break. 7. 5-10 minutes before the start of the afternoon session, you can drop off your child/children to the Child Care room again. Your child’s/children’s release card(s) will be given back to you as well. 8. Don’t forget to pick up your child once the session is over. Same steps apply. 7. Only those children who will participate in the special dance number will go back to the child care room after lunch for the final rehearsal. Make sure that your child/children have already worn their hip-hop dance attire when they come in. Those who will not be part of the dance presentation should stay with their parents already. 8. After the presentation, kindly meet your child/children back stage. Make sure you have your release card(s) ready so that the teachers can hand your child/children over to you. He/she will be staying with you during the entire duration of the anniversary celebration. The Child Care room will be closed already. If you have any questions or concerns, you can approach any of the Children’s Ministry/Child Care Volunteer Team Members and we will be more than happy to address your queries. Thank you in advance for your cooperation and support! We really appreciate it! You’re tired. We get that. Life is hard. No arguments there. It’s all a mess. A bigger mess than when an elementary school student accidentally pulls a fire alarm. But with every accidental fire alarm pull, there are always people to restore order. Oddly enough, there are a healthy number of people that will deny the chaos that plagues their lives. Much like the elementary school students, they have no idea what is going on around them, and so they choose to do what everyone else is doing. Can I tell you something? From one elementary schooler to another, there IS a way out of that mess. The teachers and staff members help guide us to make sure no harm comes our way. Despite the chaotic appearance, there are individuals who are watching over us. Take it out of the “elementary school” scenario and put it into real life. What chaos in your life plagues you? Is it your marriage? Your family? Relationship with your parents? Children? Firstly, let me tell you that I have no clue what your personal struggles are, but I know people that are able to help. So, if you’re a confused elementary schooler just like I was, then come and join us, and maybe you’ll find that teacher that will help direct your track. Q: How much is the fee for the seminar? A: $15 to cover the expense of food, snacks and materials for 2 days. On the day of the event, sign in at the registration table and you will be given 2 colored tickets, one for each day of the event. Each ticket will have a control number. No ticket, no food. If you lose your ticket, approach anyone from the registration team. A: Yes but only for children ages 4-12 years. 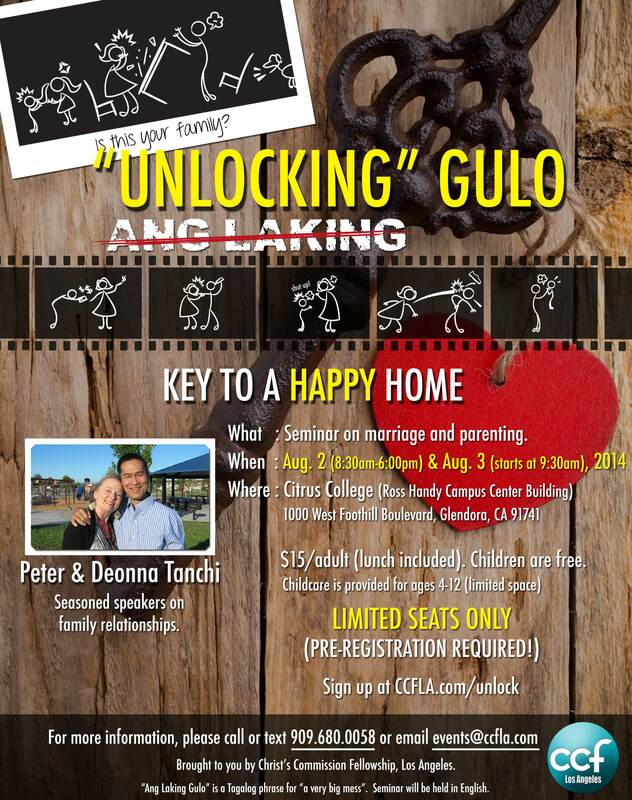 Parents will have to either pre-register the kids or register on the day itself. A waiver (please download and fill up before you arrive) needs to be signed and parents will be given claim IDs which have to be surrendered at the end of the day. Q: Do I have to pay for my kid’s meal? A: No. Children’s meals are free as long as they are registered. Q: If you have any other questions?